Navionics WebAPIv2 WordPress plugin allows you to easily add Navionics maps to your WordPress blog. This plugin allows you to use the Navionics WebAPI v2 in your WordPress blog. You can create a map component (for Ski or Boating) and a Full Navionics Products Catalog and visualise them into Pages or Blog article with a simple shortcode. On Admin panel you will find simple forms where you can build your component following the same instructions present on http://webapiv2.navionics.com. With the above procedure, you will generate the related shortcode to be used in tour article or posts... that's it! Visit the Navionics WebAPIv2 website for documentation, support, and information on getting involved in the project. There's a GIT repository too if you want to contribute a patch... you are welcome! We have an entire team of Engineers ready to help you. Ask your questions in the support forum, or contact us directly. The Navionics WebAPIv2 WordPress plugin is under GPLv2 License and it use the library Navionics WebAPIv2. "Navionics WebAPIv2 WordPress plugin" can be installed using integrated WordPress plugin installer or manually. Under Search, type in ’Navionics WebAPIv2’. A popup window will ask you to confirm your intent to install the Plugin. If this is the first time you are installing a WordPress Plugin, you will need to enter the FTP login credential information. If you've installed a Plugin before, you will find pre-filled login information. Click Proceed to continue with the installation. The installation screen will show the result of the installation as successful or not and in this case the list of problems during the install. Download the 'nwa.zip' file from ’Navionics WebAPIv2 WordPress plugin' directory page. Extract the 'nwa.zip' file and upload ’nwa’ folder to the ’/wp-content/plugins/’ directory. 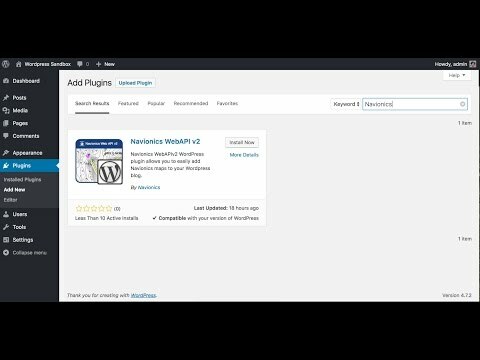 Activate ’Navionics WebAPIv2’ plugin through the ’Plugins’ menu in WordPress. Read more about Examples and 'Navionics WebAPIv2' key activations on our Navionics WebAPIv2. You can edit the content above on GitHub and send us a pull request!